Meet CMS’ President Brian Kelly at Sage Summit and attend a 10-minute iRecruit demo to be automatically entered to WIN an escape for 2 for 4 nights at the gorgeous Club Tesoro Wyndham Cabo San Lucas Resort. 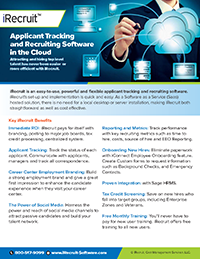 iRecruit is a web-based applicant tracking software designed to provide any size of business a cost effective, affordable and simple way to handle their recruiting process online. iRecruit provides you with your own career center that will allow your applicants to select the position they are interested in, and apply online through your website! Weekly demos, Tuesdays and Thursdays at 2pm Eastern Time (Register Today), or call us at 1-800-517-9099 to schedule a demo at your convenience. This entry was posted in Blog, Events, iRecruit Blog and tagged Brian Kelly, Sage Summit. Bookmark the permalink.